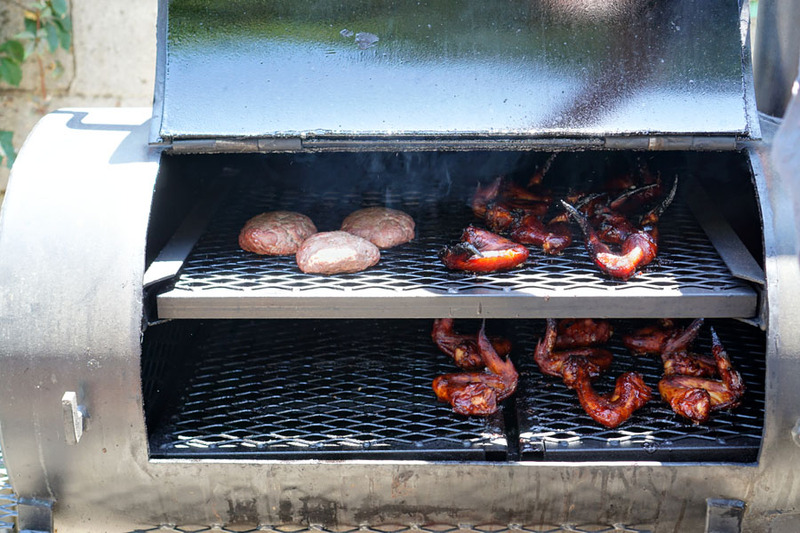 It's summer in SoCal, which means it's prime time for some backyard barbeque. 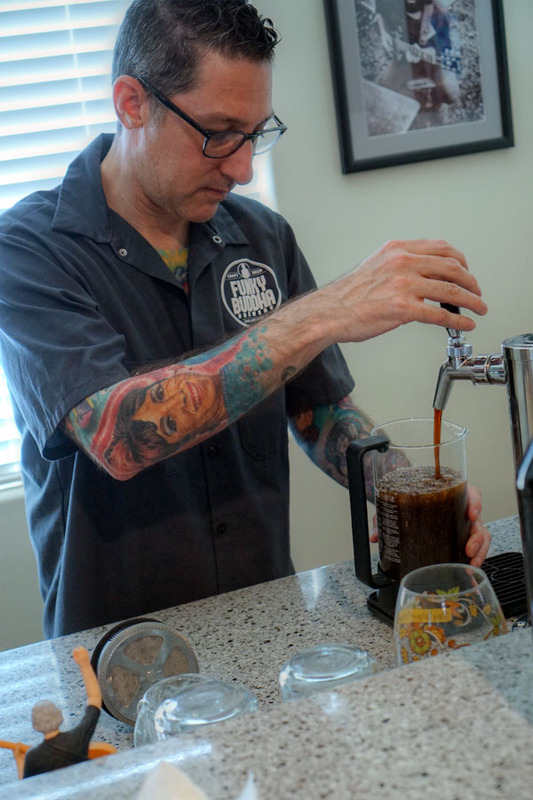 I recently attended such a happening up in the Valley--put on by one Marc Kilmnick (who specifically requested that I write-up this meal)--and as always, there was plenty of beer to go around as well. We commenced with some hops, starting with a growler of the 2017 Monkish Heart Turns Cold, a double IPA with Citra, Galaxy, Mosaic, and Simcoe. Bouquet was bitter, citrus, juicy, with a strong grapefruit pith quality. On the palate, I found it viscous, soft, with relatively subdued hop bitterness, light tropical fruit, and plenty of grassy, citric notes. Nice! 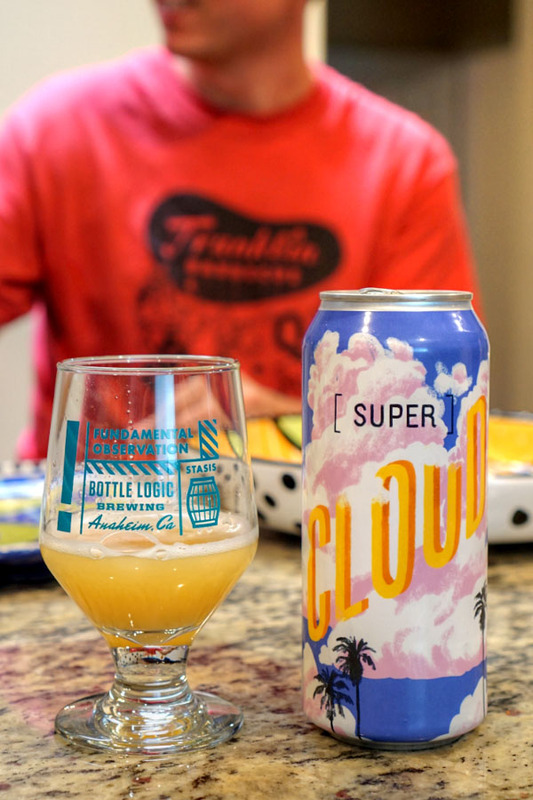 Next was the 2017 Highland Park Super Cloud, a hazy IPA hopped with Galaxy, Amarillo, and Vic Secret. The nose here was decidedly dank, with an almost savory quality layered with citrus. Taste-wise, I really didn't get much surprisingly, just a touch of grass, a bit of fruit, and a smidge of bitterness lasting on the finish. Not too interesting, though easy drinking. 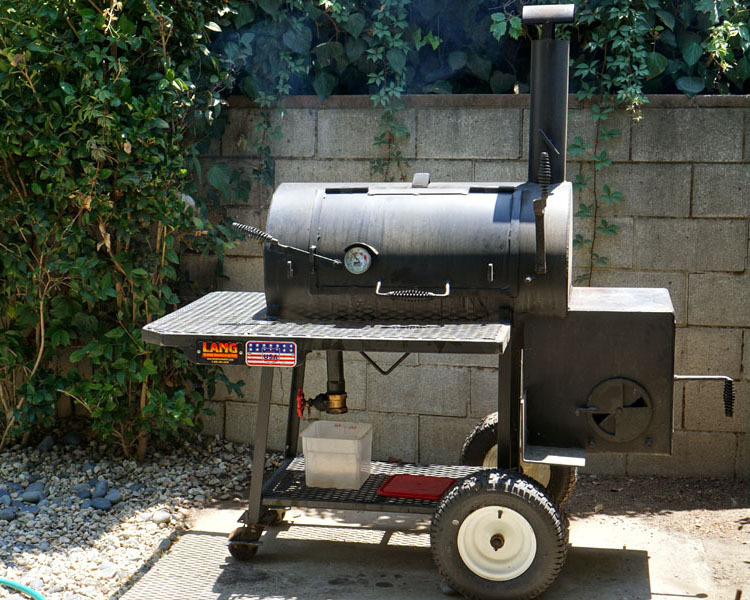 We ventured out into the backyard (and the blistering heat) to get a gander at the smoker, a 36" Original model from well-regarded producer Lang BBQ out of Nahunta, Georgia. According to Kilmnick, he started the smoking process at 6:00am, and was using hickory wood as fuel. 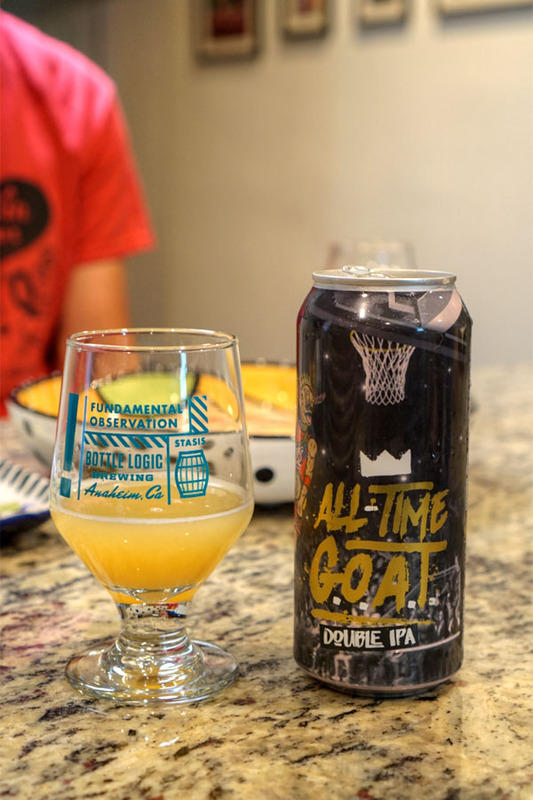 A NE-style double IPA, the 2017 Noble Ale Works All-Time G.O.A.T. was hopped with Galaxy, Nelson, Citra, and Simcoe. Nose on this one was very green, without too much of that juiciness, fruitiness, or floral character desirable in the style. The taste followed, with more grassy, musty notes backed by plenty of lingering bitterness. Definitely not the GOAT. 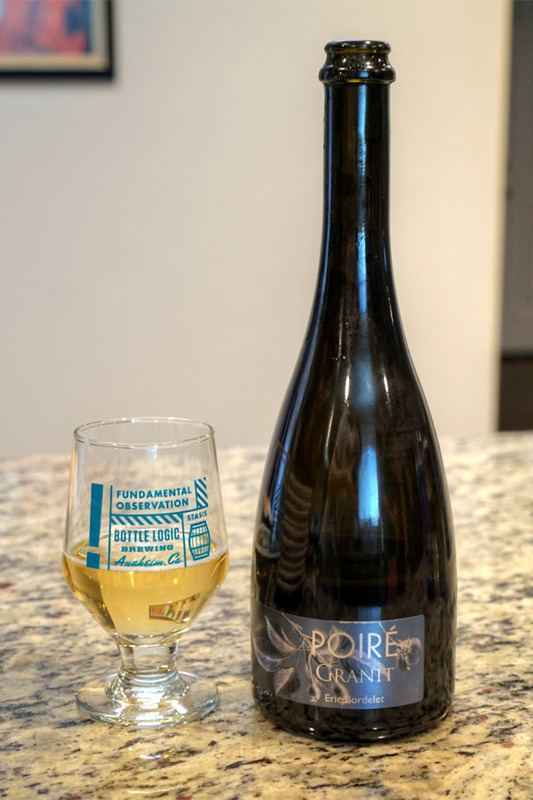 Next, we moved in a completely different direction with the 2014 Eric Bordelet Poiré Granit, a sparkling pear cider from Normandy. Aromas were a familiar combination of sweet and tart, alongside juicy pear and a pinch of grassiness. The palate was waxy, thick, tongue-coating, with a great commingling of fruitiness and funk. 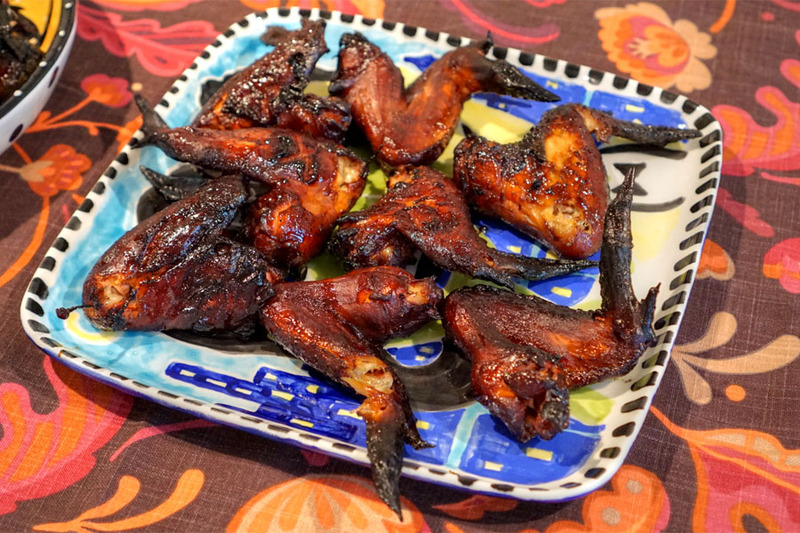 Our first set of wings came glazed with Sweet Baby Ray's. The chicken itself showed off a good moistness and tenderness, and had its smoke offset by the sweetness of the sauce. 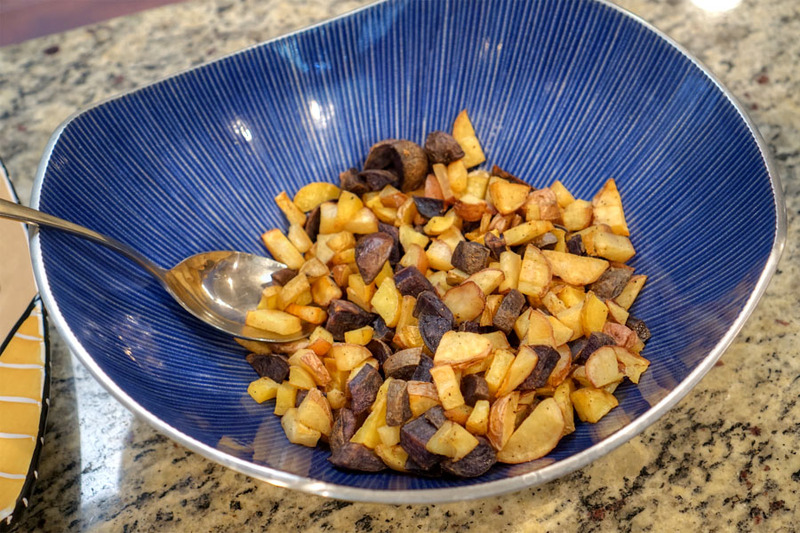 Roasted potatoes had a slight sweetness to 'em, and unfortunately were on the dry side. 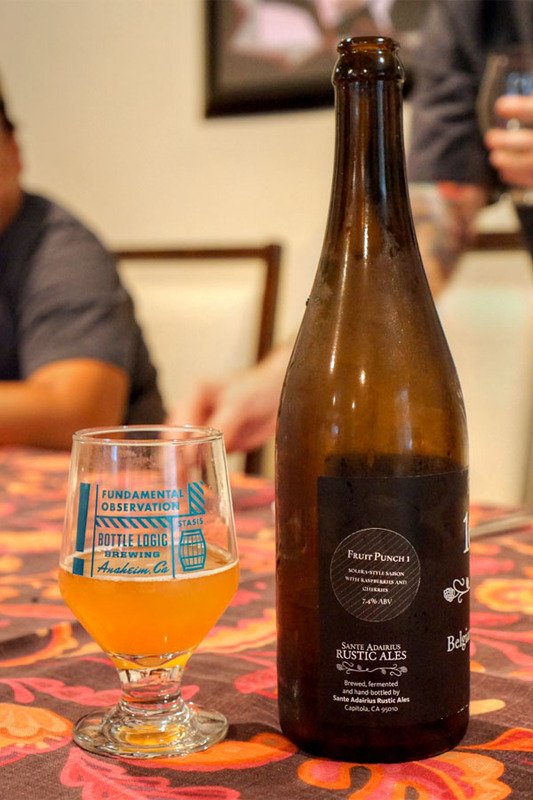 To pair with the 'cue, we opened the 2016 Jester King Figlet, a farmhouse ale fermented with smoked Texas figs that was created in collaboration with Austin's super-famous Franklin Barbecue. 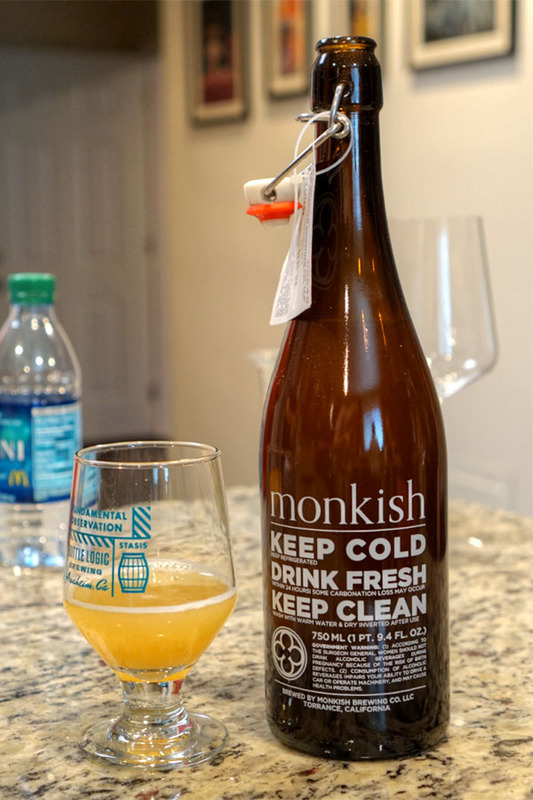 I'm usually not a fan of smoky beers, but this was much better than I'd anticipated, with lots of figgy, fruity, funky flavors backed by a persistent tartness. The smoke was there, but just. Burgers aren't something that I usually have smoked, but they worked out pretty well today. 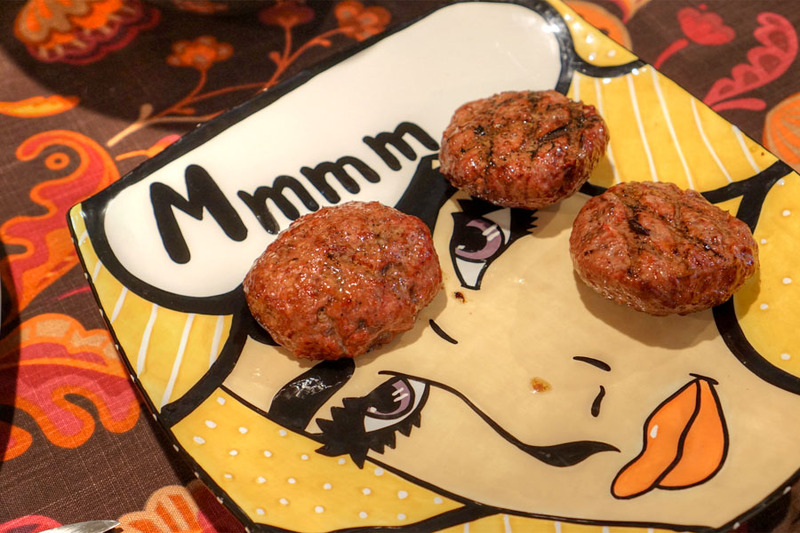 Think juicy and crumbly, with pure, unadulterated beef flavors and merely a trace of smoke. I would've liked some more aggressive seasoning, though. 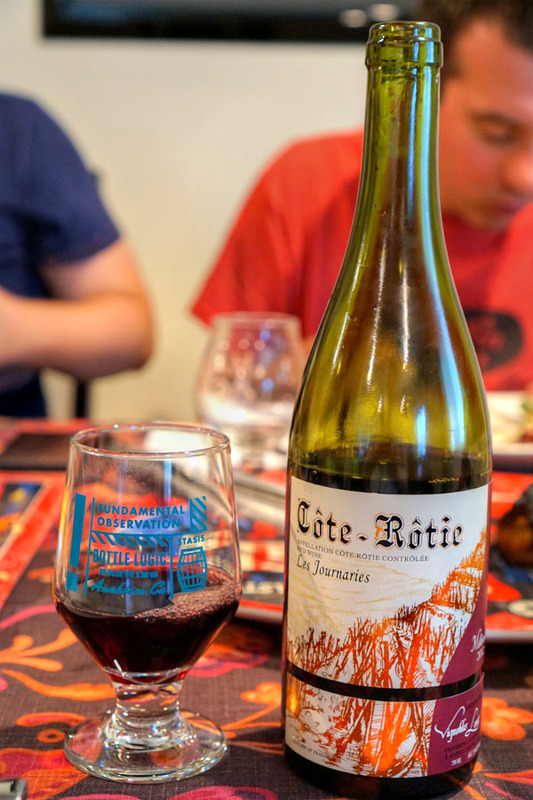 Our lone wine came from Northern Rhône, the 2012 Bernard Levet Côte-Rôtie Les Journaries. Its bouquet was on the delicate side, with fruit, flowers, and light spice. In terms of taste, I got your classic savory notes, a bit of smoke, perfume, berry, and a lot of pepper on the close. Quite nice overall. 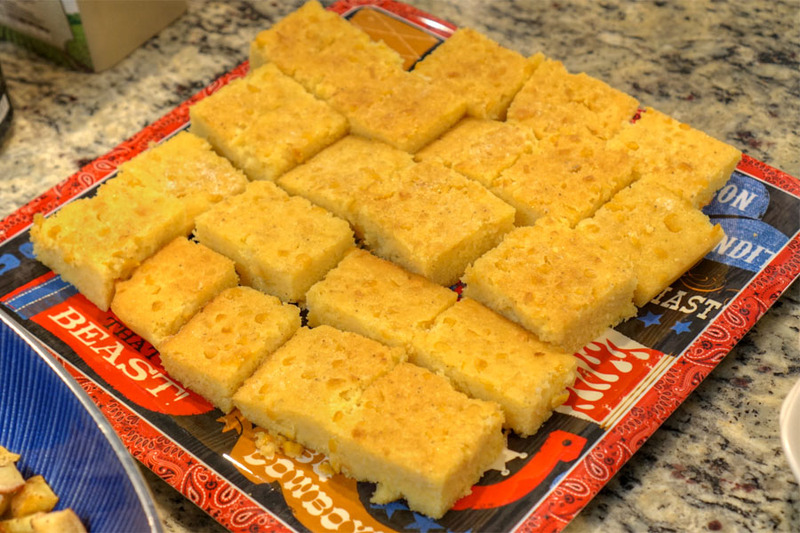 The cornbread was a standout, with just the right amount of sweetness in a moist, gritty package. Yum. 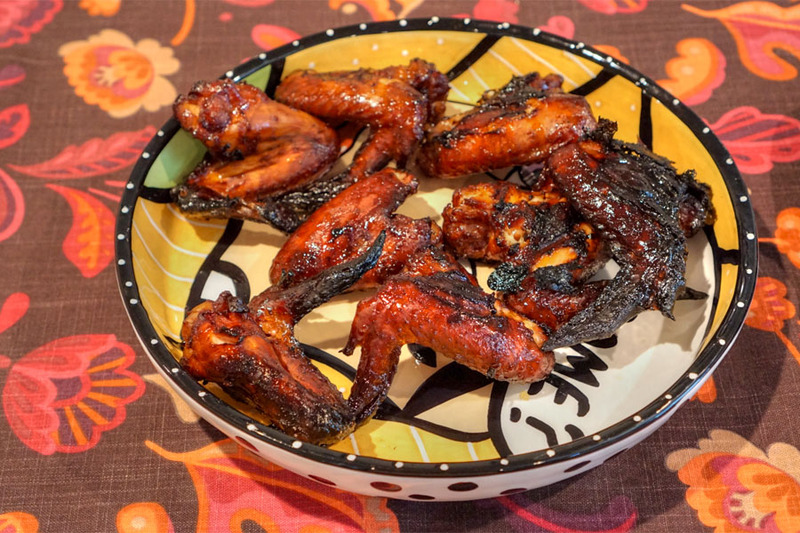 The second set of wings came dressed with Trader Joe's Kentucky Bourbon sauce. 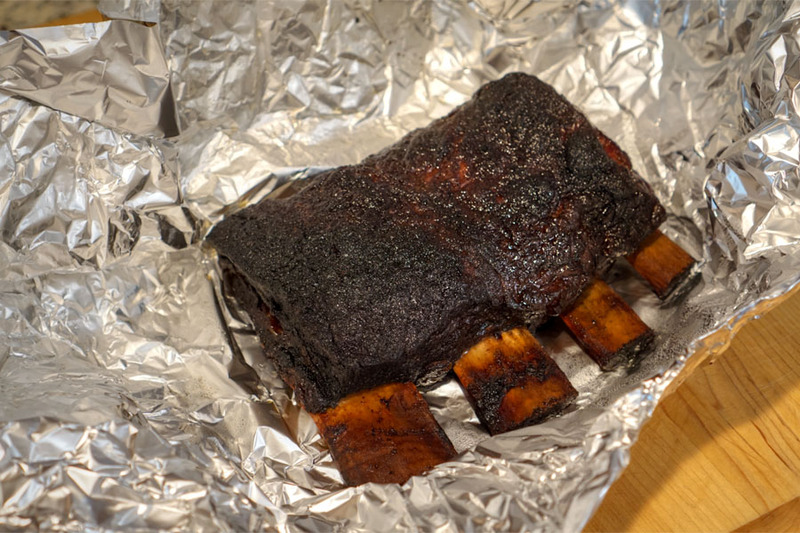 This one definitely had a smokier, weightier quality to it, though there was still an apparent sweetness. I'd actually be curious to try the chicken sans sauce to see how it compares. 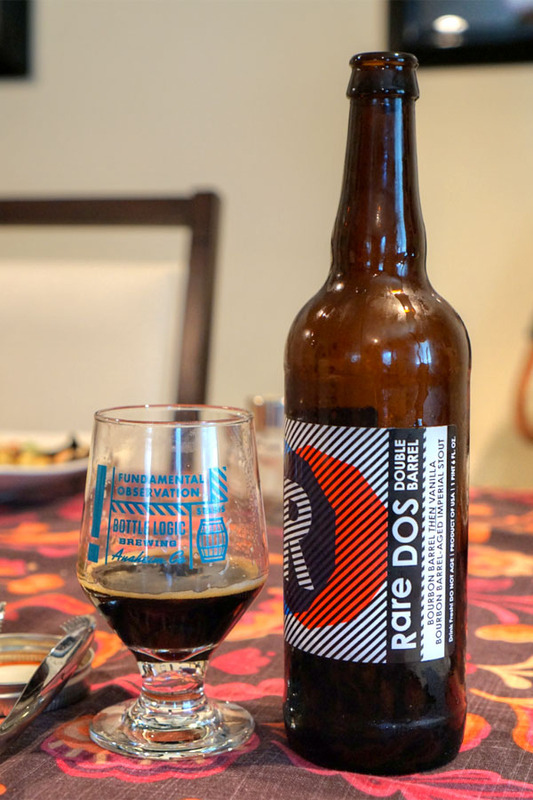 Getting into the heavier stuff now, we had the 2017 Cycle Rare DOS Double Barrel Vanilla, an imperial stout aged in bourbon barrels, then aged in bourbon barrels again, but with vanilla. Nose was definitely roasty and malty at first blush, with vanilla and light oak coming in. The palate brought more of that aforementioned roasted malt, along with boozy bourbon and a good amount of lingering vanilla on the back end. 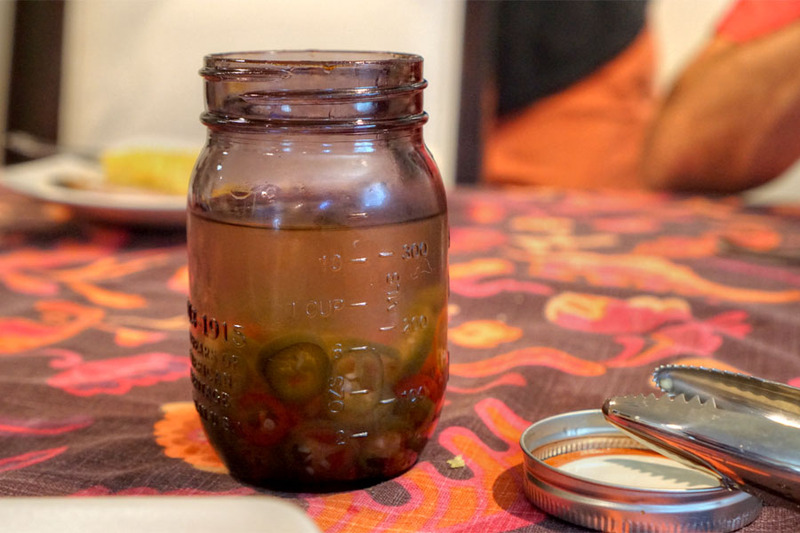 Homemade pickled jalapeños weren't shy about their heat, though they did have a sweet-ish edge. 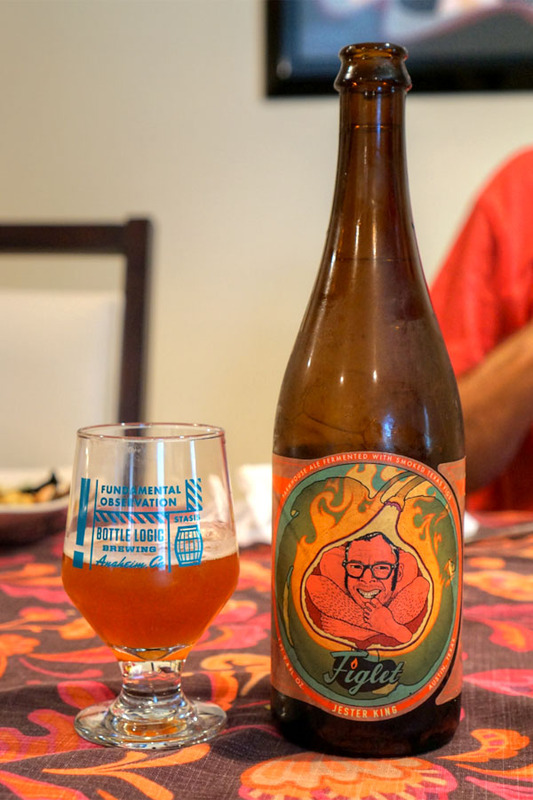 Here was the 2015 Sante Adairius Fruit Punch #1, a solera-style saison with raspberries and cherries added. The beer smelled of balsamic vinegar, with tart, acidic nuances and tangy cherry. 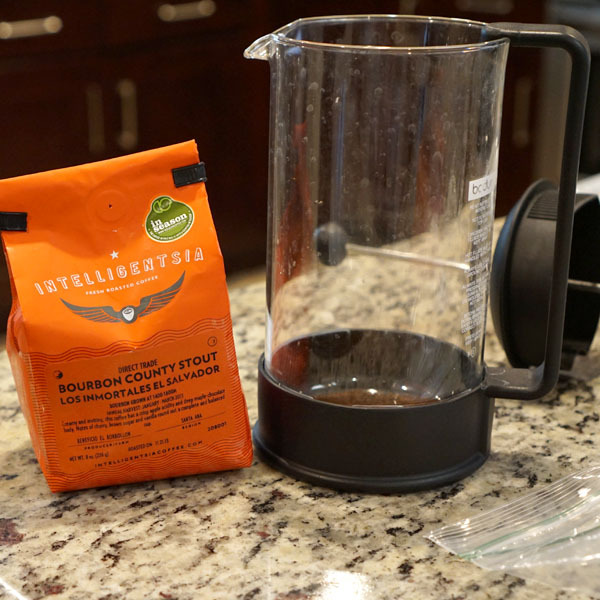 The taste was similarly tart, and slightly oxidative, with a slight yeastiness and faded fruit flavors. 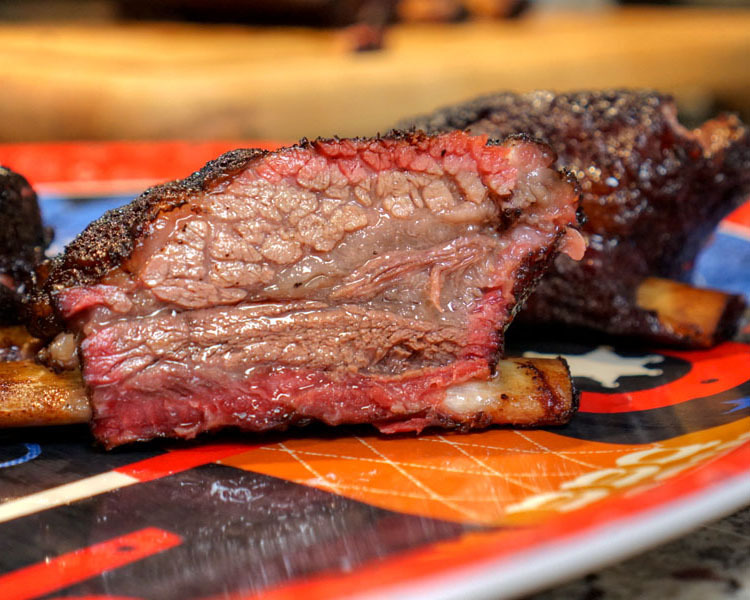 Today's pièce de résistance was undoubtedly the short rib. 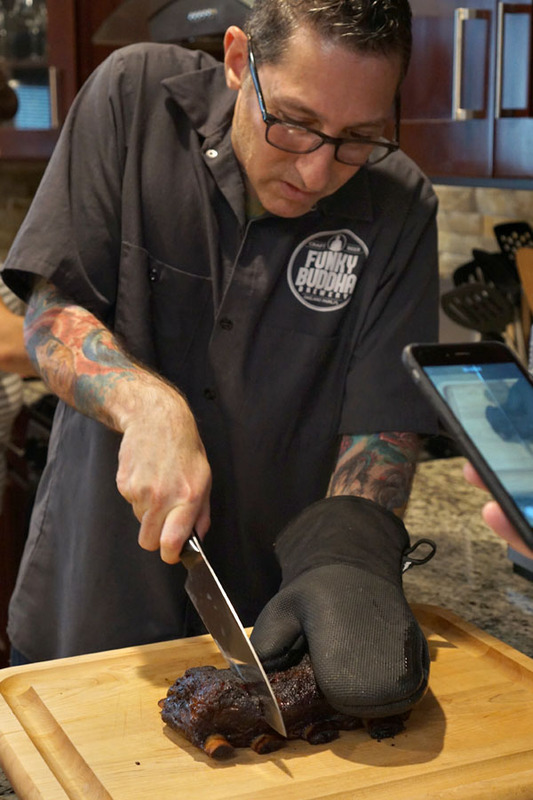 Texturally the beef was juicy, supple, with well-integrated fat, while its flavors represented a great back-and-forth between smoke, salt, cow, and the meat's dry rub. 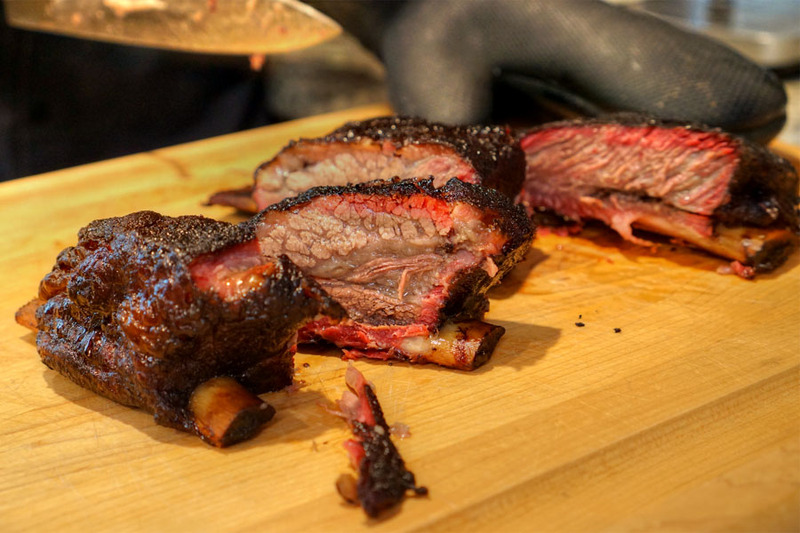 One of my fellow diners even commented that the rib was almost "brisket-like." Delish--I wanted to go back for more! 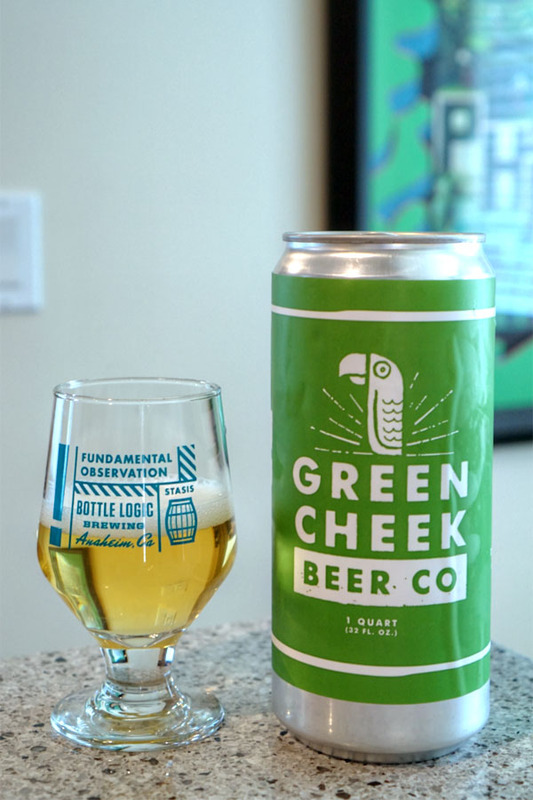 Now for something lighter: the 2017 Green Cheek Happy Pilsner, a German-style pils. Aromas had a sweet, almost honeyed character, with a good amount of graininess. The palate was relatively crisp, with more grain and sweet malt along with a very light hoppiness. 2016 - Lots of oak, tanginess, and cocoa powder on the nose, along with dark fruit. The palate was relatively light, with oak, caramel, and toffee abound; slightly hot. 2015 - Similar bouquet dominated by cocoa and oak. On the tongue I found this smoother, and less boozy, with a more pronounced dark fruit character. 2014 - The aroma definitely had the cocoa dialed down, but instead showed off a malty, candied sweetness. The taste was also sweeter, with lots of berry and still a good amount of heat. 2013 - Cocoa and dark fruit on the nose, with but an odd cardboard-like element. Taste-wise, this one went tarter, spicier for sure. 2011 - Smooth, almost honeyed aromas--quite a change from the preceding beers. Flavors, meanwhile, were heavy on the oak, while the stout also displayed a rather bitter finish. 2010 - The O.G. had a delicate nose of sweet honey. On the palate I found this super smooth, with more of that honey along with an oxidative bent. Overall, it was pretty interesting to see how the beer had evolved over the years. I'd say that it definitely gets mellower, sweeter with time. 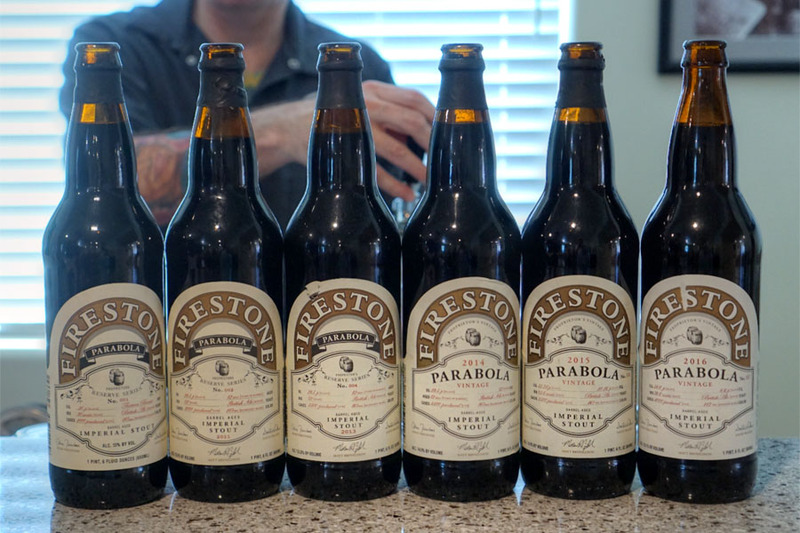 We also sampled the 2017 Firestone Walker Parabola from the keg, French pressed with Intelligentsia Los Inmortales coffee from El Salvador. The end result was delightful. 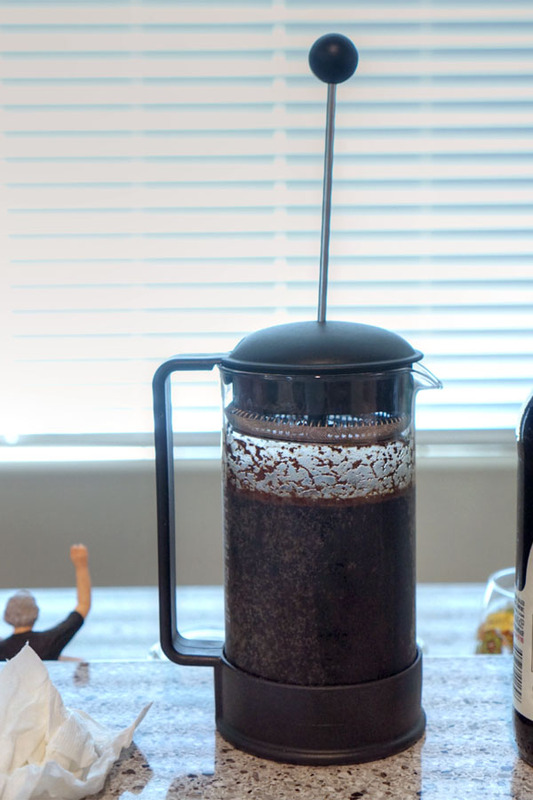 The nose was brimming with super aromatic, roasty, fruity, chocolatey coffee notes, while the taste showcased more sweet, berried, roasty coffee, along with the oaky, malty qualities of the base beer. Wow. 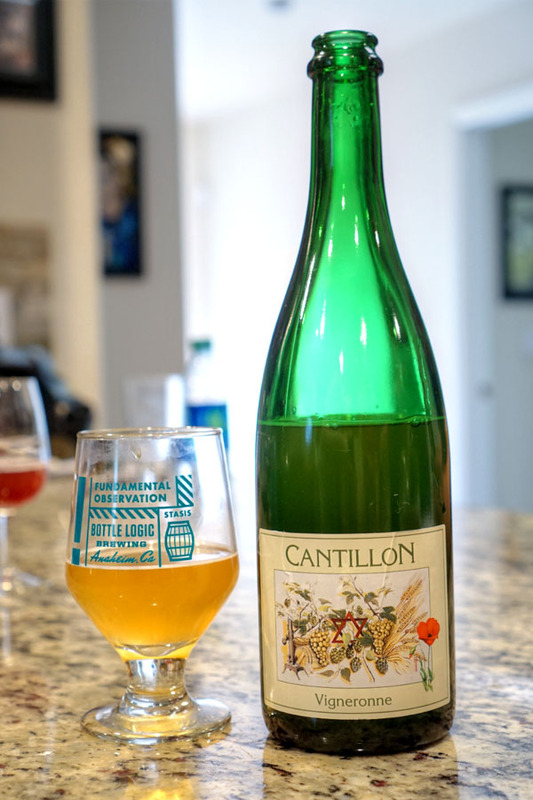 Getting back into the sours, here was the 2016 Cantillon Vigneronne, a two-year-old lambic blended with Muscat grapes. The beer smelled funky, barnyardy, with hay and vinegar throughout. The vinous character was a lot more pronounced on the palate, which was softer than one would expect given the nose. Some pronounced oak in there, too. 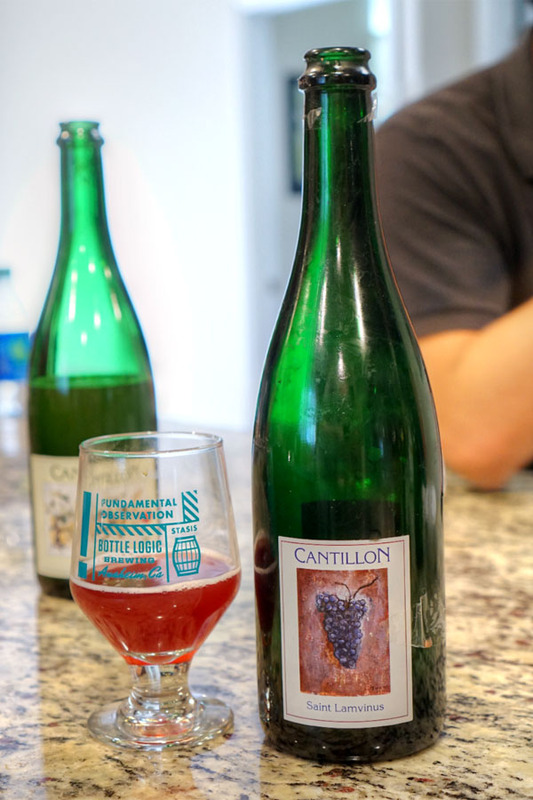 The 2016 Cantillon Saint Lamvinus was the companion beer to the Vigneronne above, made with Merlot. The nose was expectedly musty, with sourness, oakiness, and subdued grape. The taste conveyed more of that barnyard initially, with the Merlot and its tannic qualities coming in more on the mid-palate. 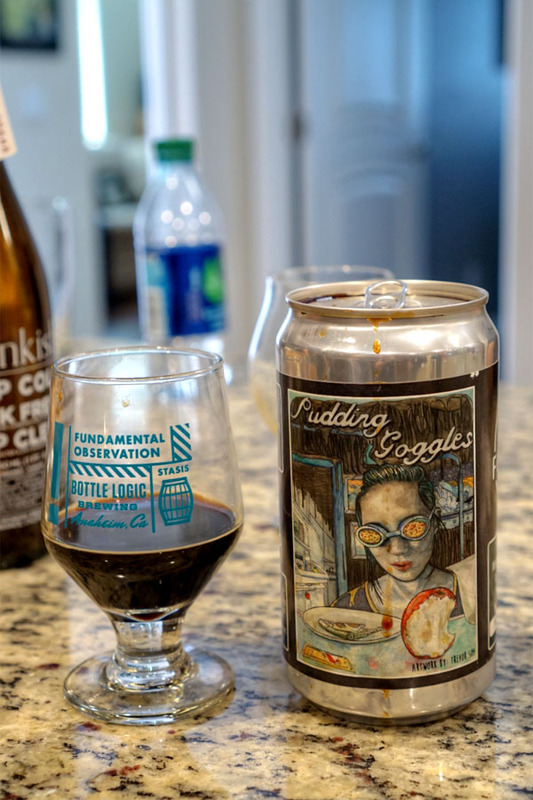 Dessert beer duties were handled by the 2017 Forager Pudding Goggles, an imperial porter aged on toasted coconut, cocoa nibs, vanilla beans, and a smidge of cinnamon. Huge aromas of toasty coconut all over the place, backed by chocolate. The taste was definitely sweet, with lots more coconut, cocoa, fragrant vanilla, and barely detectible cinnamon spice. A fun one for sure. 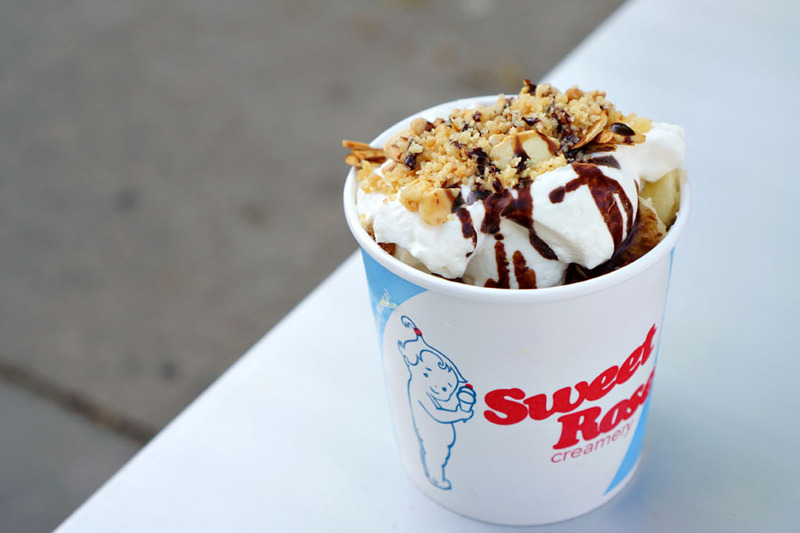 And speaking of dessert, on the way back we stopped by Sweet Rose Creamery for a Banana Split with Strawberry and Blueberry Muffin flavors. Man you gotta keep those '16 Loons down for a few more years. Other than Fou' they're always better with age. I hear ya. Though in this instance, someone else had brought the Cantillons, so it was pretty much up to him. I certainly didn't mind drinking them young lol. anon: I got a case of each. 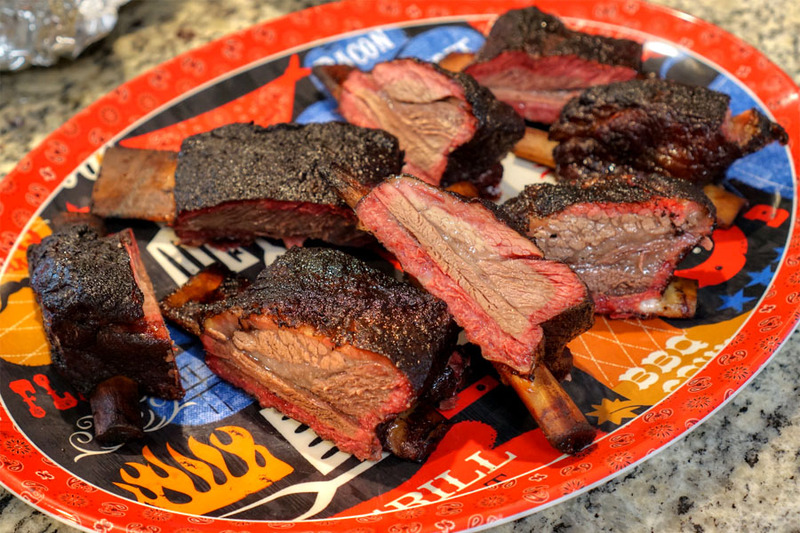 I'll open them whenever I damn well please ;p.
Gotta give props to anyone who takes the time to make short ribs like that at home!